Cape Town Aikido is delighted to host a seminar with Glenn Leichman Sensei, Chief Instructor of Aikido Seattle and Aikido Willapa Bay. 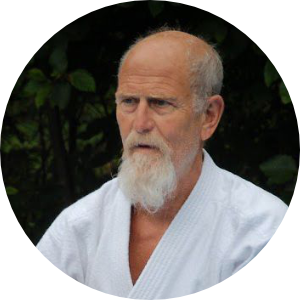 Glenn started Aikido in 1981, and has been a student of Endo Sensei since 1997, from whom he has received all his Dan ranks. In 2016 he received his 5th Dan. Glenn also has a PhD in Psychology and maintains a private therapy practice. Glenn emphasizes achieving a calm state of mind and performing unhurried technique. The seminar will focus on natural movement and rhythm in Aikido. This is a 'pay as you are able' seminar. We would suggest about R175 to R200 / class, but pay what is possible for you. The seminar is being held at the Moya Centre, 81 Kommetjie Road, Fish Hoek. For further information please contact craig@aiki.co.za. Glen Sensei teaching the New Year's Seminar at New Orlean's NOLA Aikido. Charles Colten Sensei taking ukemi for Glenn Sensei at Aikido Seattle.